I flew into New York last week. From the air it still looked like winter, grayish brownish city stretching into the distance from JFK as we flew low over Long Island Sound to land. I took the arduous trip by subway, usually 2 hours to arrive at any Brooklyn address, and got to my daughter’s new apartment where her bed is about 20 feet from the elevated tracks of the J-M-Z. I slept through it with ear plugs my first night, and then moved over to Donald N-S’s place on Grand Army Plaza at the gateway to Prospect Park. 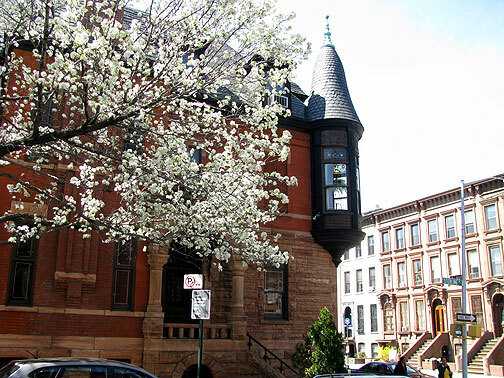 All around Park Slope in Brooklyn, and even in City Hall Plaza in Manhattan, spindly dormant trees were giving way to spectacular explosions of color in plum and apple blossoms, and wildly exuberant magnolias. Spring was springing! 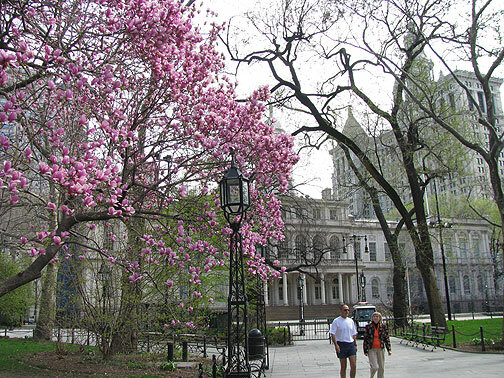 Magnolia in City Hall Park, New York. There were two reasons to be in New York, the big one for me was Francesca’s 25th birthday! Amazing to be the parent of a 25-year-old, especially such an all around wonderful person who also happens to be a smart, radical, engaged charmer… lucky me! She was part of the 2nd occupation of New School a week ago or so, and when their best laid plans were met by Vietnam war criminal and school president Bob Kerrey ordering the police to violently evict them. Francesca got heavily pepper sprayed, and jailed overnight with the rest of the occupiers, but they are now receiving great support from New School faculty and much of the student body, nearly all of whom detest Kerrey and want to see him go. To what end, though? They eschew demands, and see their efforts as a broader effort to jumpstart a more thoroughgoing student movement of social opposition. 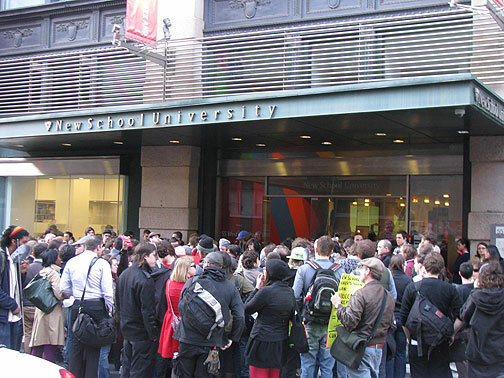 Demo at New School over police attack on occupiers, April 16, 2009. 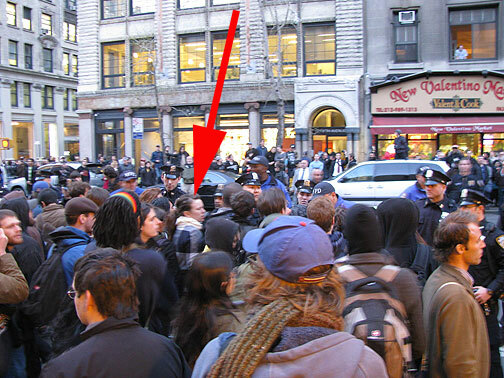 Here's Francesca in a scuffle on 5th Avenue, but she avoided arrest this time! 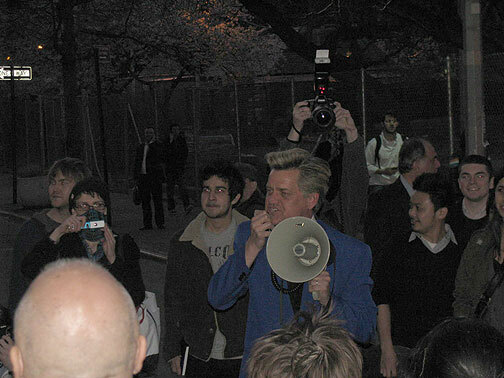 Reverend Billy showed up in front of NYU to support this small wandering demo... the next night he had the launch party for his Mayoral campaign! The second reason was to speak at Left Forum. I’m not sure what I was thinking, but somehow given that a lot of Midnight Notes and Retort pals were going to be there too, I thought the conversations would be a lot more interesting. And sure, among us they were. But the overwhelming tone of the Left Forum is the kind of tepid, earnest, delusional leftism that thinks the Nation is a seriously critical journal, that Obama can be influenced to a “progressive” agenda, that “jobs” are a worthy social demand, and that the bailout just didn’t go far enough, not that the whole system is broken and needs to be completely discarded. OK, that’s not entirely fair. The opening plenary on Friday night April 17 featured five speakers: Richard Wolff, Arlie Hochschild, Adolph Reed Jr., Katja Kipping, and Walden Bello. Wolff made an odd argument that the period 1870-1970 was a century of steadily increasing wages and standards of living, and since then the stagnant wages and expansion to 2+ wage-earners per household had thrown the system into a deep crisis. But the crisis he defined was one of the raised expectations of the working class, now clearly no longer meet-able. Strange way to frame the moment (the whole weekend’s title was “Turning Points”). Hochschild seemed to be imploring the state to take on a caretaking role, bolstering the safety net, in a pretty traditional U.S. liberal appeal. Reed was honest about the abject state of the Left, but his delivery was so herky-jerky that many in the audience were leaning forward trying to extract unfinished thoughts from his tortured syntax. His call for a reinvention of the Left might have been a healthy appeal except so many in the audience were the tired retreads of east coast left intelligentsia, and it’s pretty absurd and counterintuitive to expect them to be innovative thinkers or activists now. Kipping is from The Left Party of Germany, and she reiterated a lot of predictable points about the state and the left, but it wasn’t until Walden Bello that anyone even mentioned the word ‘ecology’! After lunch I was on, in a panel mistitled “Counter Culture Industries: Capitalist, Anti-Capitalist, Non-Capitalist”. I did a version of my Nowtopia talk after a long analysis of Shepard Fairy, and some strange and impenetrable discussion from a guy from the “Philadelphia Institute for Advanced Studies”. It felt like a speed-dating version of my talk, compressed into 15 minutes (it’s usually about an hour or slightly over). But it seemed to be ok by the reviews I received. I was followed by Steven Duncombe, the author of “Notes from Underground: the Zine Revolution” and “Dream”. He was apparently a contributor to the fantastic spoof edition of the New York Times last fall too (along with the Yes Men). I read Dream on the plane coming back from the UK; I’d had it for a while and didn’t like it too much when I first looked at it, but reading it all the way I got a better opinion. I still don’t agree with him. But I see what he’s trying to do, to make an argument that we live in a world dominated by dreams and fantasies–by the spectacle, in a word–and that appeals to rationality and reason fail to persuade a majority of the population. Thus, political radicals need to get comfortable with speaking to dreams and fantasies, creating ethical, participatory spectacles (he glows about Critical Mass), and ultimately we should embrace the spectacle as a means of communication in order to take seriously the necessity of contesting for power in society. I’d rather go with the John Holloway idea of “changing the world without taking power” but that dismays people who want to “do politics” in the here and now. After the panel I was invited to the Paper Tiger room where they were interviewing participants. The guy warned me that he was going to ask me silly questions and he did. “What super hero would you be with what powers, in order to change the world?” “If you had a 60-second ad on the Super Bowl, what would you put on it?” I realized that maybe they too had just read Dream, and were trying to work with the categories that have been thrown up by the society of the spectacle. I just wanted to run away! So on Sunday I spent the day walking around in Prospect Park instead of returning for more intellectual torture, helping my daughter get a new phone, a new bike, and a nice Korean BBQ dinner to celebrate 25 years! And then early the next morning I flew home! Blossoming tree on 6th Avenue in Park Slope, Brooklyn.